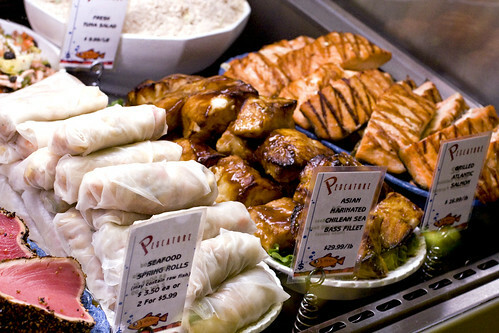 I used to think Grand Central Terminal’s Market has nothing fit for me, in regards to food. It’s just a transfer hub to get to work with the occasional need of caffeine from my beloved Joe that opened ever since the past fall. Arguably, it’s the best thing that happened to this station for me. I depend on my life for good coffee. But I needed more than just coffee and willing to open my mind a bit when I was invited by Susan to try a few things from this vast area. 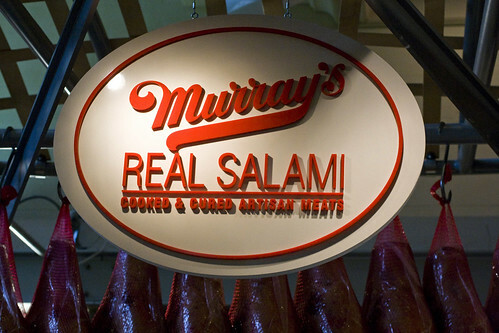 The past Friday afternoon, I’ve met Susan to a tasting at Murray’s Real Salami. We got acquainted and eventually met our charcuterie guide, Aaron. Aaron gave us a whirlwind of a meat tour and almost tried one of everything in their display case (as you see the photos above; just click on it to know what is what). 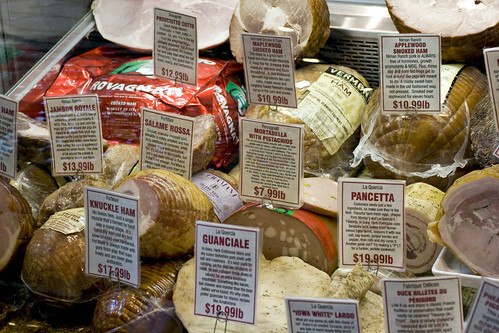 There are a some missing photos since it’s almost back-to-back samplings of meat (the Prosciutto de Parma and the coarsely ground, duck rillettes – which is similar to pâté, if you ever ate it). My favorites were the acorn fed piggy, the Iberco bellota. It’s so nutty, silky but admittedly a tad chewy. The lardo that made me craved for a fresh, crusty baguette to nosh on, and a rich (reads: 75/25 pork-to-fat ratio), complex, wine-y, rich Felino salami. The others were great but it didn’t knock my socks off as the ones I’ve just mentioned. 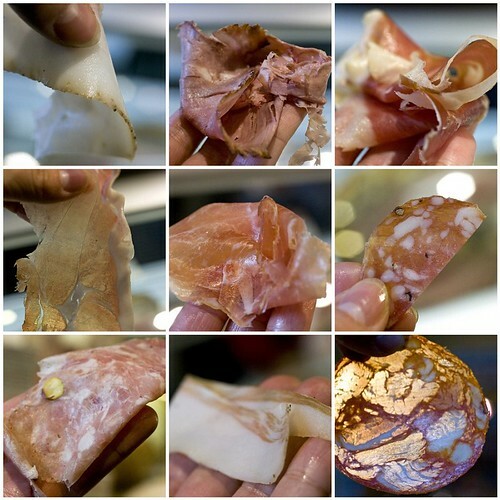 All of their meats are sliced tissue paper thin by machine. I know some of you salume snobs would prefer to have some of your meats cut by hand but at least it’s consistent here and I’m content with it. After eating (and arguably, hardening my arteries) Susan took me over to Pescatore and we’ve met with the outgoing, hospitable co-owner, Glenn. 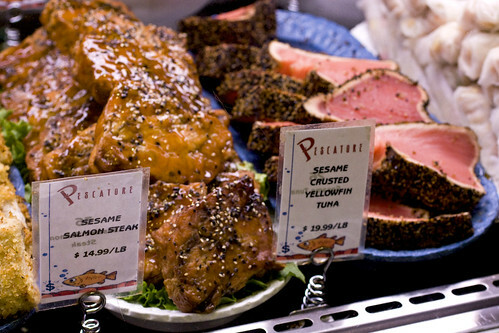 Pescatore started as a wholesale seafood company that gotten a retail outlet here in Grand Central Market and expanded with their prepared seafood. His brother Jerry, who was a CIA alum created recipes for the prepared foods. It’s a logical and a good business idea to do so since they have great ingredients, utilize it and charge in accordance to the quality of the food. 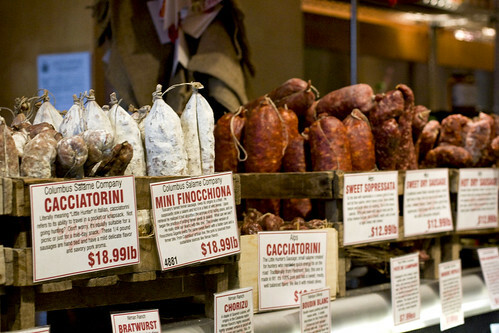 But what are hardened arteries when you have salami like that to taste? So jealous. I live in Ohio, and I’m not sure a tasting of bratwurst would be quite the same. Calling Cards stat. This place looks awesome. Great find! We used to live in the NYC and shopped at Pescatore frequently. They have awesome stuff and very knowledgeable help. We now live in Florida and order from there internet company All Fresh Seafood and it’s just as good!